For the month of December, I'll be doing my first co-hosting linky party with Alicia of Beanie n Us sharing with every one our Advent activities of crafting ideas, book reviews, homemade gifts, we will also touch a little bit on the traditions or stories behind them. 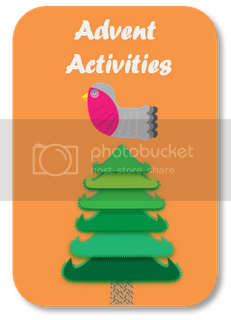 Incidentally this is the first time I am doing Advent activities, plus I am only a crafty person who only THINK and seldom make it, thus I am feeling excited and fill with vibes about the event. It took me a day to give it some thoughts and decided to do something that we can decorate the living room or our Christmas tree. Yupe! We are finally going to have a Christmas tree in our house, HORRAY!!! Gingerbread Man is DinoEgg's favourite since a few years ago, so I thought what's more appropriate to start our first Advent craft then the Gingerbread Man? 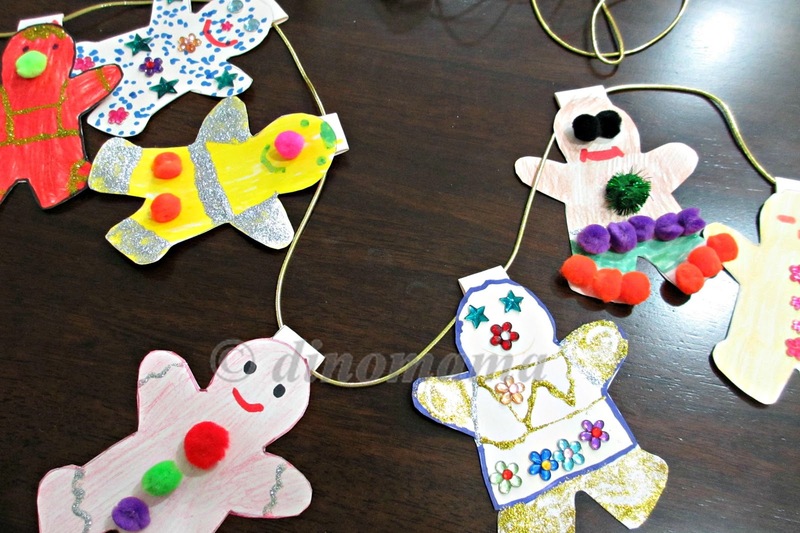 And there you have it, a simple Gingerbread Man Streamers craft. * some papers - any type of paper; construction paper, plain copier paper or even left over wrapper paper. 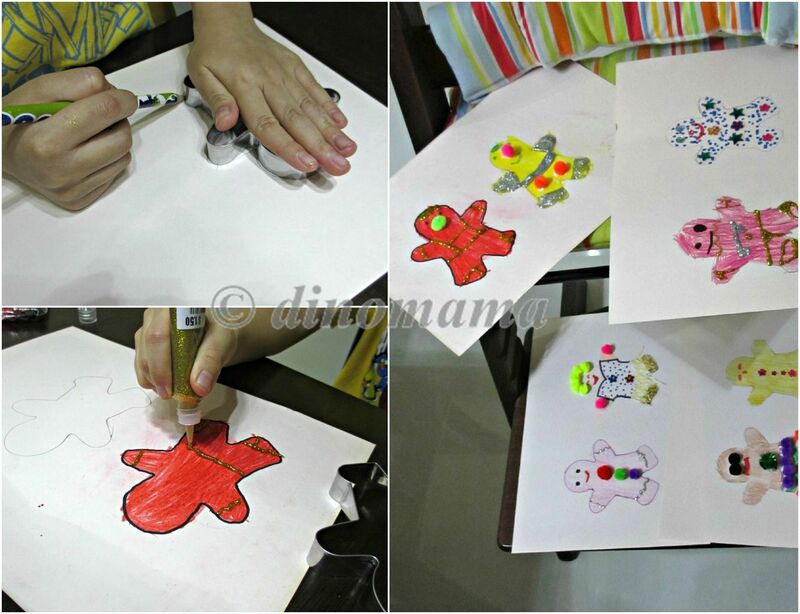 * Gingerbread man cookie cutter - Trace the outline on the paper and you have a very nice gingerbread man shape. You can also find gingerbread man shape online and print them out. 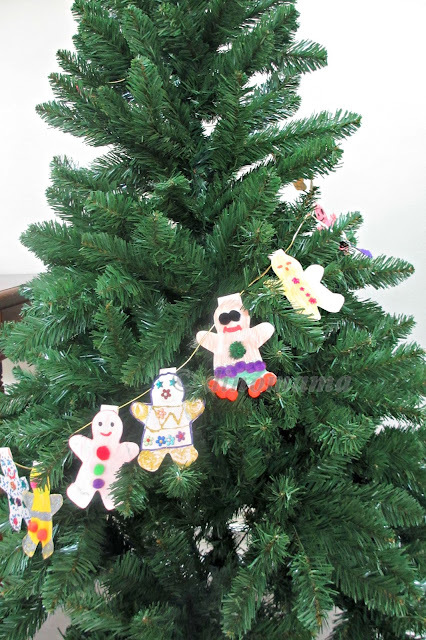 * Color pencils, markers or crayons to color your gingerbread man. * Some embellishments to decorate your gingerbread man, we have some colorful pom pom balls, glitter glue, cosmetic cotton wool and craft gems. * Craft glue & glue dots to stick the bling bling onto the gingerbread man. Leave them overnight for the glue to dry. The next day, cut the gingerbread man out, make sure you cut a tab at the gingerbread man head, fold it and tape it down. Sting them together, I'm using an elastic golden cord, you can use whatever is available on hand. Here's the strung up gingerbread man. I put them on our very bare Christmas tree, they look a little bit big on our 5 feet tree but its ok, they look colorful & cheerful, instantly brightening up the tree. Christmas is a much celebrated day, you can see the malls starting to put up Christmas decorations about a month before the day. Many people also starts to decorate their home, some for religious significance to the Christian religion and some like me, just to join in the celebration. I did a search on google and found out that during the ancient times, Christmas decorations involved natural materials such as holly, mistletoe, bay, and evergreen. Interesting! You can read more about it here. So have you started to decorate your house to welcome Christmas? Do share with us your decorated Christmas tree or beautiful decorated house. Ya! Our tree is still with the streamer on it, the ONLY deco currently wahaha~ Sad tree. nice~ I like the idea. Thanks for sharing! You are welcome! 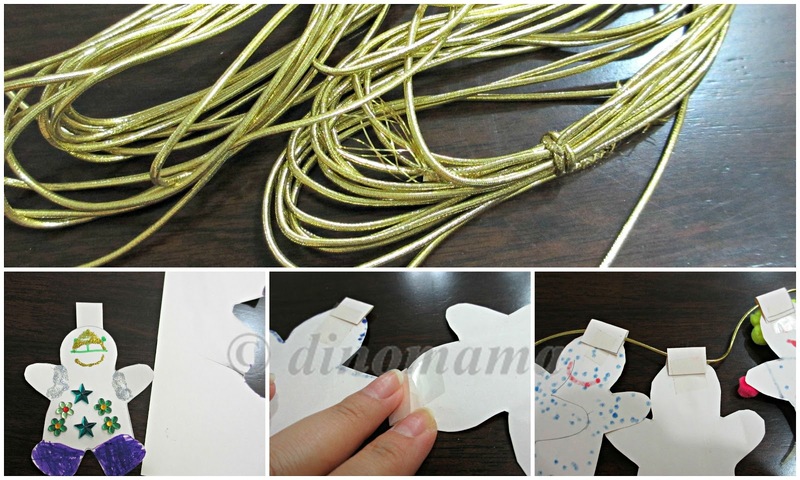 Have fun making your own streamer! Simple, nice and colourful! Love how all the gingerbread men look so different in the end. =) Thanks for sharing! We try to make it different so its not as boring.